From the looks of things, it appears that Metallic Cat is working toward yet another record-breaking season. Last weekend, his foals dominated at two of the performance horse industry’s richest events, earning Open championships at both the Lucas Oil/National Cutting Horse Association Super Stakes in Fort Worth, Texas, AND the National Reined Cow Horse Association Stallion Stakes in Las Vegas, Nevada. Over just a few days of those shows, Metallic Cat offspring posted a nice $177,164 and broke an all-time score record in the process. 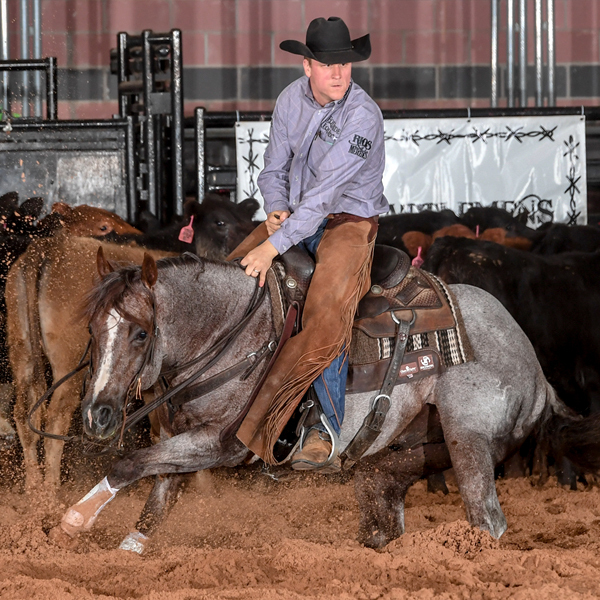 At the NRCHA Stallion Stakes, Metallic Train and Clayton Edsall clinched the top spot after marking a 215 in the herd work, 214.5 in the reined round, and wrapping up with a hair-raising 227 down the fence. The 656.5 composite earned the Open and Intermediate Open Champion’s checks totaling $46,309 for owner Beverly Vaughn. Metallic Train, a mare, is out of Sparking Train by Shining Spark. That combination was also a hit in the Non-Pro division where Tammy Hays rode her gelding Metallic Sparks (out of Shine Smartly by Shining Spark) to the Championship and $8,481. Yet another Metallic Cat foal – Metal Cat – finished first in the Limited Open class with Clark Brendon. This gelding is out of Topofthestar by Grays Starlight, and he collected $7,779 for the win. That was just one more success that played a part in making Metallic Cat the NRCHA Stallion Stakes’ No. 1 sire with total earnings of $90,139. On April 1 – Easter Sunday – it was Stevie Rey Von who stole the headlines. 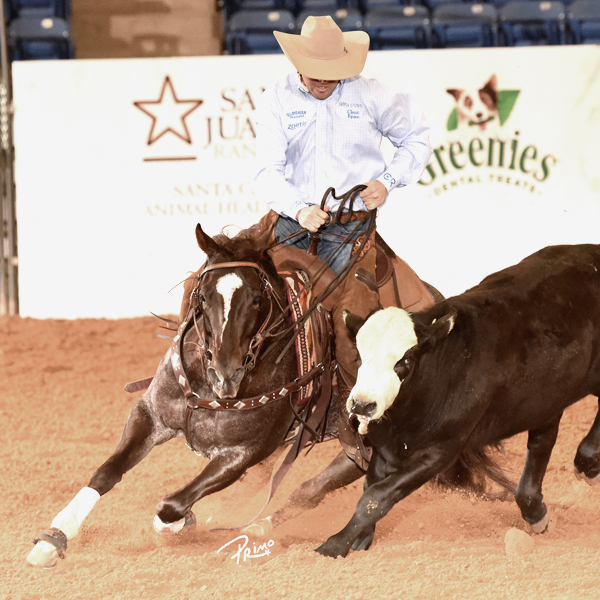 This 6-year-old stallion and Beau Galyean worked second-from-last in the NCHA Super Stakes Classic Open finals, marking a tremendous 231 to win the division and $26,216. This is the highest score ever marked in the NCHA Super Stakes Classic. Stevie Rey Von, owned by the Fults Ranch, is out of Miss Ella Rey by Dual Rey. This latest win brings the stallion’s lifetime earnings to $397,342, which includes having won the prestigious NCHA Futurity Open Championship in 2015. Kattalyst, a 6-year-old mare also by Metallic Cat, worked to an impressive 226 score to finish Reserve in the Classic Open with Adan Banuelos. That placing paid $23,576. Kattalyst, owned by 10/27 Ranch, is out of Hotness by Spots Hot. Six Metallic Cat offspring graced the elite field of 29 Classic Open finalists, adding up to a total take of $87,025. One of those finalists, Hashtags, won the Open Stakes at the 2017 Lucas Oil/NCHA Super Stakes – an event where Metallic Cat shattered records when 69 of his foals won more than $831,500 across multiple divisions, which still stands as the highest single-show payout in NCHA Super Stakes history. As for this year, there are nearly three more weeks of Super Stakes action. The show concludes on April 22 with the Open Stakes finals. Dozens of Metallic Cat offspring are performing, so it’s possible for yet another record-breaker. Metallic Cat’s owner, Bobby Patton of Rocking P Ranch, Fort Worth, Texas, is keeping his fingers crossed. One of those future opportunities is right around the corner at the NCHA’s next Triple Crown event in July. The 2018 Metallic Cat $100,000 Incentive, a bonus available to everyone who owns a Metallic Cat 4-year-old and has a 2018 contract to breed to Metallic Cat. For those who qualify, the program guarantees a $100,000 check to the highest advancing Metallic Cat offspring in the 4-year-old Open finals at the Metallic Cat/NCHA Summer Spectacular. Metallic Cat is on his way to becoming one of the biggest sires in cutting history. Right now he has $18 million in offspring earnings. In 2016 and 2017 he was NCHA Sire of the Year, thanks to foals that earned $10 million in just those two seasons. With $637,711 in lifetime winnings, Metallic Cat won the 2008 NCHA Futurity with Beau Galyean and then showed for a few months in the 2009 season. Even with limited showing, Metallic Cat was 2009 NCHA Horse of the Year and was inducted into the NCHA Hall of Fame in 2010. Now, with just five crops of show age, Metallic Cat is among the top 10 of the cutting industry’s all-time most successful sires.